The effects of the Great Depression on France's motorcycle manufacturers varied widely. The three major manufacturers - Terrot, Peugeot and Motobécane - were least affected, but Alcyon, long the number four French constructor, was hit hard, to the point that its top-of-the-range models of the immediate prewar period are rare - you might say virtually unknown. That's certainly the case with the 306A. In 1934, after a two-year absence from the French racing championship, Alcyon returned with a superb overhead-cam 350. 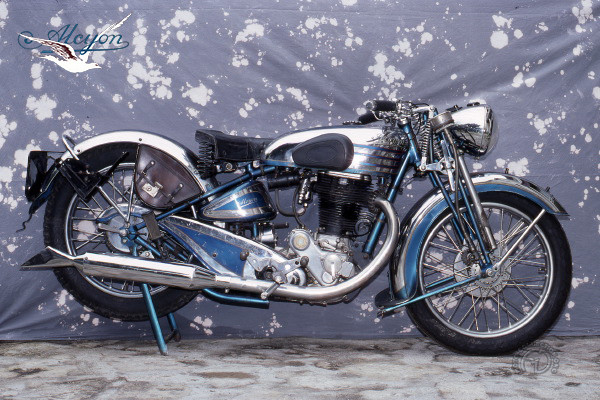 A gearbox failure cost it the championship that year, but in 1935, the Alcyon became champion of France. That success in a commercially difficult period led Alcyon (the name means "kingfisher" in French) to launch a new road-going 350 - the 306A - in 1936 alongside the aging 304A. Its styling was heavily influenced by that of the racer. The overhead-valve engine was the first unit-constructed Alcyon four-stroke engine since 1919; its foot-shift four-speed transmission was a first for the marque. Well-Styling success, commercial failure finished and generously chromed, well-equipped - electric lighting and horn were standard - the 306A was light, very reliable and, with a genuine 75 mph top speed, faster than its main 350cc rivals like the unit-constructed Terrot HR, Motobecane R44C and Peugeot 415. Despite all these good qualities, very few 306As were sold. The Alcyon 306A -a handsome bike of genu me virtues catalogued from 1936 to 1939-was rarely seen due to a weak sales network.